3 April 2007: Brogan Wharton Joins us! 30 March 2007: Website has a new look! 30 March 2007: Joanne Glasgow becomes our first australian citizen! 25 March 2007: New constitution to be drafted. 12 March 2007: 6 new citizens join us! 07 March 2007: Donald Shickle Joins Bobalania. 05 March 2007: 3 new citizens join. 23 February 2007: Robert Monteux Joins us! 20 February 2007: Michael Bryer becomes our newest citizen making our total pop. 204! 20 February 2007: We open relations with Bartonstein and recognize Roman Republic. 18 February 2007: We open relations with Euronda, Satizawa and Iridia. 09 February 2007: We have over 200 citizens! 06 February 2007: Victro Sun from the USA joins us! 05 February 2007: 20 new citizens join D.R.O.B. 28 January 2007: Karen Skeen join us! 22 January 2007: The Robinson family Join D.R.O.B. 18 January 2007: Forum officialy launched! 30 December 2006: We have our first 2 citizens from the USA!!!!! 30 December 2006: 166 citizens! 25 December 2006: Merry Christmas and a happy new year from D.R.O.B.! 22 December 2006: 143 Citizens!!!!! 21 December 2006: 135 citizens! 20 December 2006: 2 more citizens join us! 11 December 2006: 100 CITIZENS!!!! 10 December 2006: 96 Citizens! 07 December 2006: 4 more citizens making 94! 07 December 2006: We reach 90 citizens!!!!!!!!!!!!! 07 December 2006: 2 new citizens join D.R.O.B. 04 December 2006: Freddie Farkle Joins our country! 01 December 2006: The Stewart family join D.R.O.B. MAKING 86 CITIZENS! 27 November 2006: We have a new coat of arms! 21 November 2006: Reached 70 citizens!!!!!!!! 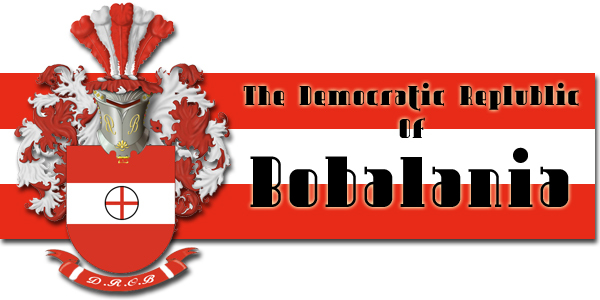 30 October 2006: 9 new citizens join Bobalania. 27 october 2006: 1 new citizen.